This is for those who do not listen to the 'Today' programme on BBC Radio 4. Right at the end of a programme recently, there was a discussion about the obscene cost of entry into Premiership football matches where the cheapest price of £60 or £100 per game is not uncommon. An elderly chap being interviewed said he could recall many years ago arriving at the turnstiles when the attendant greeted him with "That will be ten quid, mate". "What?!" the old chap said "I could get a woman for that!" 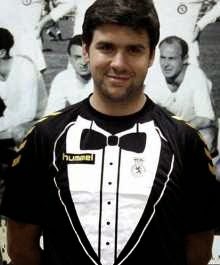 Apparently some Spanish sides are having a bit of fun with their club shirts this season - yes, it is a football shirt! You can read the full article here on the Daily Mail website. Thanks to Wallace and Gromit for passing this on. 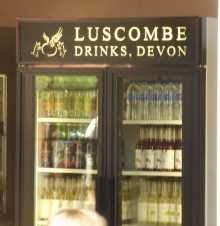 This is a drinks cabinet in the riverside cafe of a famous theatre. We wondered if it might help to explains a certain person's weight problem. Stan Laundon sent us the newspaper clipping from which these pictures come. 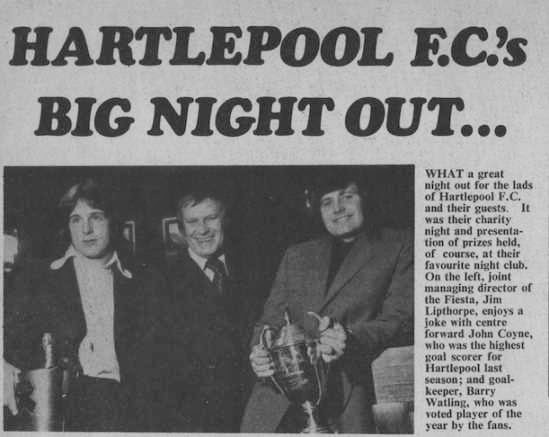 It's dated May 1973 and was Hartlepool Football Club's Big Night Out at the Club Fiesta in Stockton, where Stan (then a presenter on BBC Radio Cleveland) was asked to be the MC for the Pools' Footballer of the Year presentations. Tony Christie and The Denmen were topping the bill at the Club Fiesta that week, with support from Stockton man and wife team Ken & Billie Ford - for whom Stan Laundon also played lead guitar for the whole week! 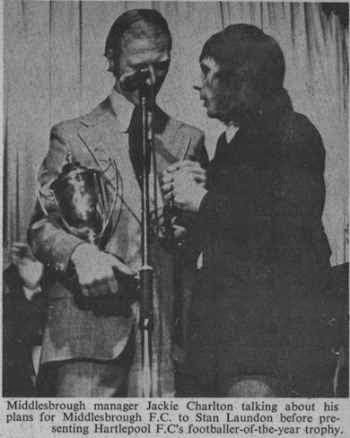 As you can see, the Pools-Middlesbrough connection isn't just a recent phenomenon, with Big Jack there to do the presentations.